When an approver requires changes to be made to a p-card transaction, the transaction will appear in the submitter’s queue with a “DEN” status for denial. The submitter must make the requested updates and re-submit the transaction. The approver’s comments can be found in the transaction. Click on Accounts Payable and then Review/Submit Transactions under Credit Cards. 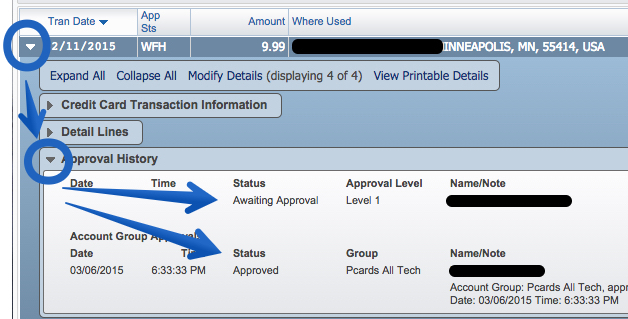 Click on the little arrow on the left side of the transaction to view details. Click on the little arrow on the left side of Approval History to view the approver’s comments.